There is a slight difference in iconography between Kamala and Lakshmi. While both are pictured seated on a lotus, with two hands each holding a lotus, and the other two hands in the mudra bestowing blessings, the image of Kamala also includes two elephants with their trunks raised, typically showering her with water. The lotus symbolizes a number of things. Kamala literally means “lotus” in Sanskrit, and spiritually it denotes purity, auspiciousness and piety, which is strongly associated with Lakshmi. However, it is also a symbol of the entire manifested universe, found in every yantra (sacred diagram) and also associated with many deities, though none as closely as Kamala/Lakshmi. The lotus itself famously grows from murky, muddy waters, bursting forth into large leaves and gorgeous, fragrant blossoms, symbolizing the emergency of the pure, limitless Atman (soul) from the limited material body, and the ability of the devoted spiritual practitioner to be untouched by the murkiness of drama, attachment and ego. The lotus is also very nourishing, almost all of it being edible and very healthy, and it thus represents the vital nature of the spiritual path in nurturing our whole self. The elephants that attend Kamala and shower her with water symbolize the fertile rains of monsoon that bring forth the lush plants and flowers of the growing season, and thus the spiritual wealth that grows through the passion of devotion and practice, which must be done regularly to bear fruit, just as rain is needed for a healthy crop. They also give her an air of regal authority, as elephants are symbols of royalty and status, and as the devoted wife of Vishnu, preserver of the universe, she is the queen and preserver of everything on earth. The elephants with their gray-blue color and service to Lakshmi may also be seen as a subtle reference to Vishnu, who has frequently been associated with elephants. Lakshmi is so often portrayed selflessly serving Vishnu, but in this image we see that Devi takes the primary position as the elephants bathe her, perhaps at the request of Vishnu himself in service to her! As the goddess of material and spiritual wealth and beauty, Kamala is most typically worshipped for her most revered power, the power to eliminate poverty. In tough economic times, Kamala or Lakshmi is worshipped in order to bring material wealth, and you’ll often find altars to Lakshmi in places of business as well as individual homes. Every married woman is considered an incarnation of Lakshmi, and global sociological studies have shown that women have a unique ability to create wealth out of meager beginnings, leading to the success of micro-loan programs to women in developing nations, which has helped improve the status and treatment of women in those places. Kamala is the pure creative force, the power to create beauty and wealth around us, and to see the beauty in everything. As the creative force, Kamala is also the Goddess who blesses families with children. Those having difficulty conceiving or adopting children may especially wish to offer worship to this powerful Tantric Goddess. If you have become happily pregnant, or have had a new addition to your family through adoption or foster care, especially if it is after much difficulty, offering thanks to Kamala and praying for the continued wellbeing of the pregnancy and an easy labor is a good way remember the Goddess of fertility, childbirth and family well-being. Kamala teaches us that when we commit ourselves to the spiritual path, as we move farther along we begin to see beauty all around us, because she is present everywhere in the manifest world. The fruit of worshipping Kamala or Lakshmi for the highest spiritual good is not only blessings of material security, but also those of spiritual progress. We begin to release the drama of our daily lives, release the bitterness and anger we have toward others who may have bruised our ego, and see the goddess in everything and everyone, in a profound and real way. This is truly Kamala – the radiant beauty of the cosmos that is manifest in the material world. She is the spirit of nature itself, and is manifest in the natural world. We can worship Kamala simply by spending time in nature and appreciating its profound beauty, and also by being stewards of the earth. This is not only done through the familiar mantra of reduce-reuse-recycle, but also by actively protecting the earth’s natural resources, and working to end the pollution and overconsumption that contribute to the extinction of plants and animals, irrevocable loss of habitat and the death of fragile ecosystems. There is much work to be done in this area, and a sincere devotee of Kamala and Lakshmi will want to protect her in the form of the natural world as much as possible by engaging in this work in their own way, according to their own ability. By recognizing her beauty in the natural world all around us, we also move further down the path of the sadhaka, the spiritual practitioner who communes with God in every moment, and offers every action to the Divine Mother as worship, remaining detached from the fruits of action and enjoying the acts of service, generosity and prayer for their own sake. In this spirit we truly begin to touch the inner nature of Kamala, the light of divine consciousness and connection with the Self. As a Mahavidya, and thus one of the ten emanations of Kali, Kamala reminds us that true wealth has nothing to do with how much money or material possessions we may have. Kamala is not about consumption for the sake of “I want.” True wealth is measured by generosity, spiritual depth, and freedom from ego-driven desires. She is the spirit of giving, not of taking. She is the spirit of receiving graciously and gratefully, not of greed. When we ask Kamala to help us in service of our highest spiritual good – whether that be in the form of spiritual or material wealth, without attachment to her more glitzy blessings – she is happy and gives us all we desire, though in the form that is best for us, not necessarily in the form we may be expecting. When we look to her as an ATM or a rich auntie, just there to give us cash and fancy presents, then she may also give us what we want, but along with all its negative consequences. She has a tendency to remind us – sometimes painfully – that she is also Kali, who teaches detachment and surrender, whose gifts are meant to be used in service to the highest good, not to sink us further into our limited ego. This is why wealth can be so fleeting, why someone wealthy and successful may have lots of riches but an unhappy family life, or why we may find ourselves suddenly without a job so that we may learn to surrender and trust the Divine Mother as we find a path forward that serves the highest good, rather than being seduced by our own hubris or worldly desires for the sake of material gain. Kamala can thus also be a teacher around financial responsibility. Learning to save instead of spend, paying off all debts, investing wisely and without reckless greed, not taking what is not freely given, regular charitable giving, not spending more than you can afford – these are all ways of being a proper custodian of her blessings. At the Sri Sri Kamakhya Temple in Assam, India, the inner sanctum (garbha griha, literally “womb room”) of the temple houses not only the peetham of Sri Sri Kamakhya Devi, but also of Matangi (Sarasvati) and Kamala (Laksmi), and so when one receives darshan of Kamakhya, they also receive darshan of Matangi and Kamala. At the Sri Kamakhya Mahavidya Mandir in Alameda, California, the primary altar in our temple is also home to these three powerful Devis. You can worship Kamala to help manifest creative vision, eliminate poverty, stabilize your home, open your heart and deepen your spiritual practice. Ultimately, she is the goddess of spiritual wealth above all else, and so all of us should worship her daily, to receive her brightest, most shining blessing of all — liberation. Lakshmi Puja is Kamala’s special holy day, celebrated on the full moon of Ashvin, typically in early October after the end of Durga Puja and before Diwali. However, you do not need to wait for Lakshmi Puja to worship her! Puja simply means “worship,” and it need not be formal. In our temple, worship is often performed as simple home worship, from the heart, as this pleases the Goddess. If you have no knowledge of Sanskrit, simply speak to Her from your heart. Mother accepts all sincere worship! This simple ritual is designed for those who have no previous knowledge of Devi worship. It requires no special knowledge or initiation, only a sincere desire to offer yourself in service to the Mother. First, if you don’t have an altar dedicated to Kamala or Lakshmi, create one. As Kamala and Lakshmi are the same goddess, there is no need to create a new Kamala altar if you already have a Laksmi altar. You may create a simple altar by placing a beautiful cloth (white, pink, yellow or red are all good colors) on a small table or flat surface that is not directly on the ground. Then, place an image of Laksmi or Kamala on top of this – it can be a standing framed photo, a murti (statue), etc. Place a vase or plate of flowers on the altar, as well as a candle or oil lamp and some sweet-smelling incense. 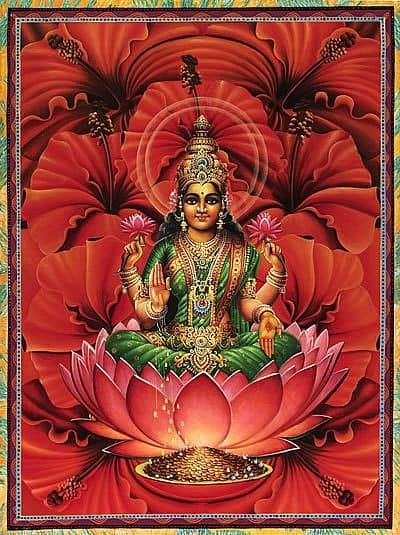 Lakshmi especially loves lotuses, roses and jasmine. Whatever flowers you have available is acceptable, however, as Lakshmi is the spirit of nature and therefore loves all flowers. Ultimately, she is the goddess of spiritual wealth above all else, and so all of us should worship her daily, to receive her brightest, most shining blessing of all — liberation. During Lakshmi Puja, it is also beneficial to place a sheaf of rice stalks. In the West, because our diet is largely wheat-based instead of rice-based, you may alternatively place sheafs of wheat, which are easier to find, or you may use any other form of grain. This is a symbol of abundance and the foundations of sustenance, both in the physical and the spiritual realms. A small bell with a light sound will be helpful, as many believe that Lakshmi doesn’t like loud noises but prefers soft sounds. If you do not have a bell, don’t worry! If this is your first time offering worship to Lakshmi, it is not necessary as long as your worship is sincere. On special days you may also offer a basket or plate which contains a sari or small piece of fine cloth, a small mirror and comb (symbols of beauty in the manifest world), a small white conch or other white shell (symbol of clarity), and any kind of coin (symbol of material wealth). Next, get a small cup – a stone or stoneware cup, or a clean glass, stainless steel cup, brass or copper cup, or even a silver or gold cup. Put coconut water or purified water into this cup, and place it on the altar along with the basket or plate. Standing or kneeling in front of the altar, take a few deep breaths and feel your devotion for this beautiful goddess. Recite her pranama mantra. This mantra praises Kamala as the great goddess Lakshmi, who is beloved and grants all desires, who nourishes us in our spiritual life, and who loves white flowers, and whose form is white and pleasing to look at. White in this context is the color of sattva – ultimate reality, the oneness that is devoid of color – and she is seen as the pure, gentle, independent, powerful, virgin Goddess. With your left hand, ring the bell softly. With your right hand, take the candle or oil lamp and wave it clockwise before the image of Lakshmi three times, in your mind offering it to her with sincerity. Next, take the basket and wave it clockwise before the image three times, again offering it with sincerity. Say the above mantra again, and bow deeply before the image. You may wish to kneel and touch your forehead to the ground, a traditional gesture of great respect. At this point, you may ask Lakshmi for Her blessings, and offer thanks for all the blessings She has given you. End the puja by bowing again, and imagining the power of peace and well-being spreading out across the world, asking Lakshmi to take care of all beings. After the puja, use some of the uncooked rice in a meal, as prasad, the blessing of Lakshmi. Save some of this uncooked rice in a special place to be used for next year’s Lakshmi Puja. Use some of the water to prepare the food, and pour the rest at the base of a tree, offering it back to the Mother Earth. The other items may be saved in a special place to radiate blessings throughout the year. This is not a formal puja, but is simple worship that anyone can do. If you do not know how to offer puja, this will be a simple and beautiful way to begin, until you can learn more. Remember – our Divine Mother accepts all worship offered sincerely, for we are all Her beloved children.